That Butterfly Won't Bite You : 13.7: Cosmos And Culture When children have so little experience of nature that they fear butterflies, how should we respond? That's the question anthropologist Barbara J. King asks after reading about a new garden at the Dallas Arboretum focused on educating kids. 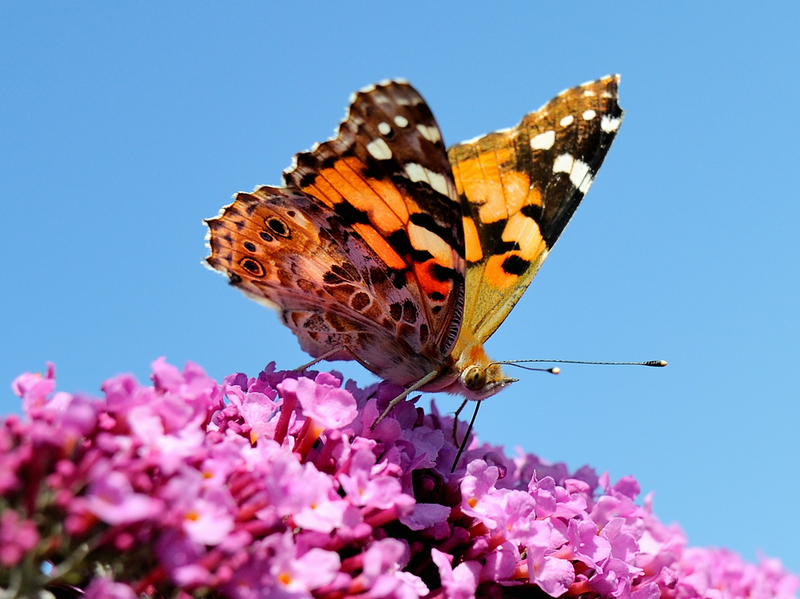 A butterfly pauses on a buddleia flower in Godewaersvelde, northern France. We have watched many times a butterfly come flying at a group of 10-year-olds, and they scream and duck because they're afraid it's going to sting or bite them. If you don't live where there are flowers, you don't see butterflies. Conroy went on to mention the children's fear of squirrels and bees, as well. Now, I know that not every single child who screams and ducks actually fears biting butterflies; some of the fuss may be the natural horseplay you expect from a group of kids on a field trip. Conroy, though, is an experienced educator and she's identified something real going on here. It's not lepidopterophobia, a fear of butterflies and moths. Instead it is a startled reaction by the kids based on not having a clue about what's flitting through the air at them. Butterflies that bite and sting? Can our kids really be that out of touch with the natural world? At first, I was stunned. Then I thought a bit further. While I'm fascinated by most animals, my skill at distinguishing one species of birds from another is notably weak. I can handle the obvious suspects — like the barn swallows and the blue jays. Beyond that, it's a struggle. And I'm even worse when it comes to tree identification. Enjoying a walk on Virginia's Yorktown Battlefield, I asked my companion what sort of tree we had just stopped under. Neither of us knew, but my friend whipped out his cellphone and deployed a pretty cool app called Leafsnap that IDs a tree after you take a picture of one of its leaves. So there we were, standing under a gorgeous tree staring at a tiny screen to learn about that very tree. My point is: it's all a continuum. Some naturalists might find it shocking that I'm so bad at bird and tree taxonomy. I'd only say that, in a life that depends on learning, understanding, teaching and writing about fine distinctions in evolutionary theory and mammalian behavior, it's sometimes a joy just to wander about outside and enjoy birds as birds and trees as trees. The two situations aren't exactly comparable, of course: the notion of biting butterflies versus a failure to recognize mockingbirds or mulberry trees. But considering them together brings me to another key point. We shouldn't express surprise at what kids don't know about nature in any kind of condescending or judgmental matter. Some adults (well, me, at least) may be surprised, too, at what we don't know. And after all, why don't kids know more about nature? How can we make it more of a priority to invite them, in fun and rewarding ways, to know more? Especially, how can we do that in areas where concrete rules over green, or where it may not be safe to play outside? The beauty of the Dallas Adventure Garden is that it will offer children a chance to learn what they don't know by immersion in an edible garden, a treetop walkway and a wetlands ecosystem. That's commendable and exciting. The question remains: What happen in cities and towns that can't muster the $62 million to create such a fabulous place? I keep coming back to the simplest of all formulas, for teachers, parents, other family members, older friends of young children: find a safe place and explore. There are safe parks and gardens and patches of flowers in most communities. Seek them out; take the children outside! Teach them something about the science of butterflies and their natural surroundings. Then, and most importantly, let them stand outside in that park or garden or flower patch and feel the breeze as a butterfly flies past them, lands on a flower, and does what a butterfly has evolved to do. Let them discover something of the habits of butterflies — and squirrels and bees and more — for themselves.